I know, I know… two healthy recipes earlier this week, and then I throw these decadent cream puffs at you. I really can't help myself though! 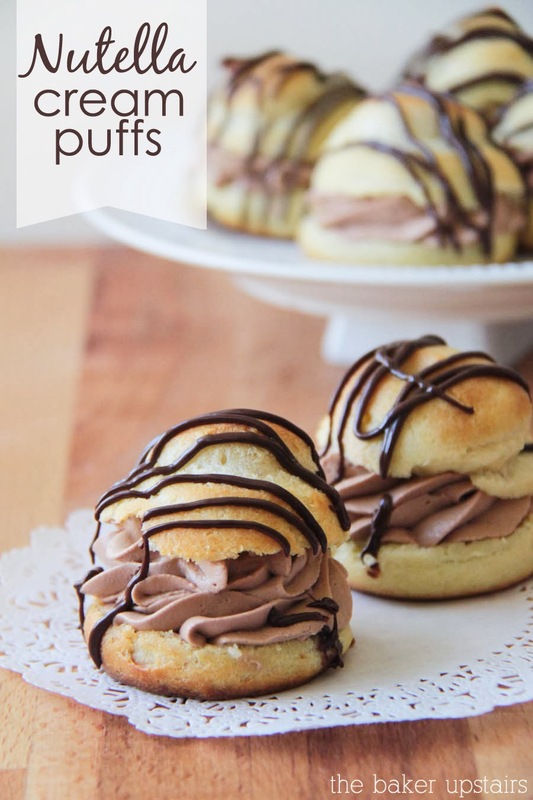 These cream puffs are so delicious! It just wouldn't be fair to make them and then not share them with the world. I think these would be the perfect dessert to share with someone you love this time of year! The pastry itself is very simple and straightforward, and the Nutella whipped cream couldn't be easier. This is one of those desserts that looks like it takes a million years and is super complicated, but is instead incredibly easy! It took me about an hour total to make these, and that includes the time I was waiting for the puffs to cool. Oh, man, these are good! Make them for your family and you'll love them like I do! Preheat oven to 400. Bring the water and butter to a boil over medium high heat, and stir until butter is completely melted. Remove from heat and stir in flour until the mixture pulls away from the sides of the pan and forms a ball. Add eggs one at a time, stirring well after each addition, until the mixture is smooth and satiny. Drop scoops of dough (or pipe rounds if you want them to be prettier) onto a baking sheet lined with parchment or a silicone liner. Bake 20-25 minutes, or until the puffs are golden and puffed up. Puffs are done when they are hollow inside. Remove from oven and let cool on a cooling rack. While the puffs are cooling, whip the cream using a stand mixer or hand mixer. When the cream forms stiff peaks beat in the powdered sugar until combined. Add the Nutella and beat until light and fluffy. 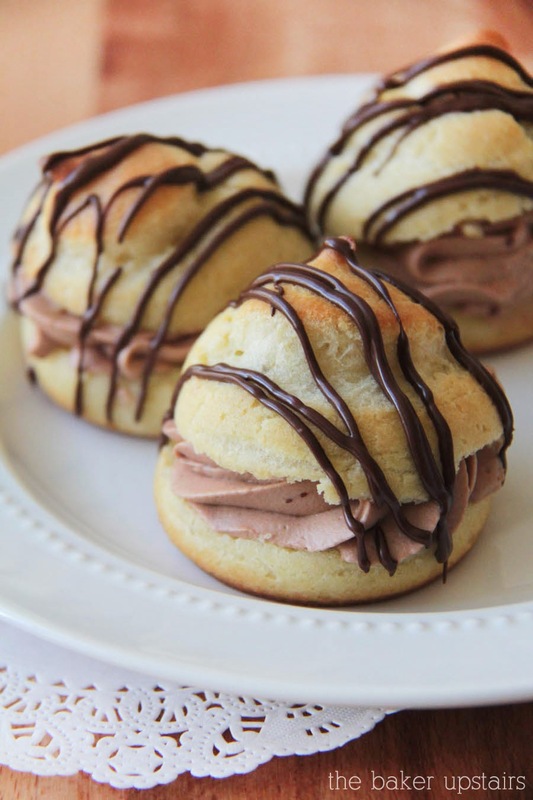 Cut cooled puffs in half horizontally and fill with whipped cream. To make the drizzle, add the chocolate chips and coconut oil to a microwave safe bowl. Heat at 50% power for one minute and stir. Continue heating for thirty second intervals at 50% power until melted and smooth. Pour the chocolate into a ziploc bag or piping bag and cut a small piece off the corner of the bag. Drizzle over the filled cream puffs. 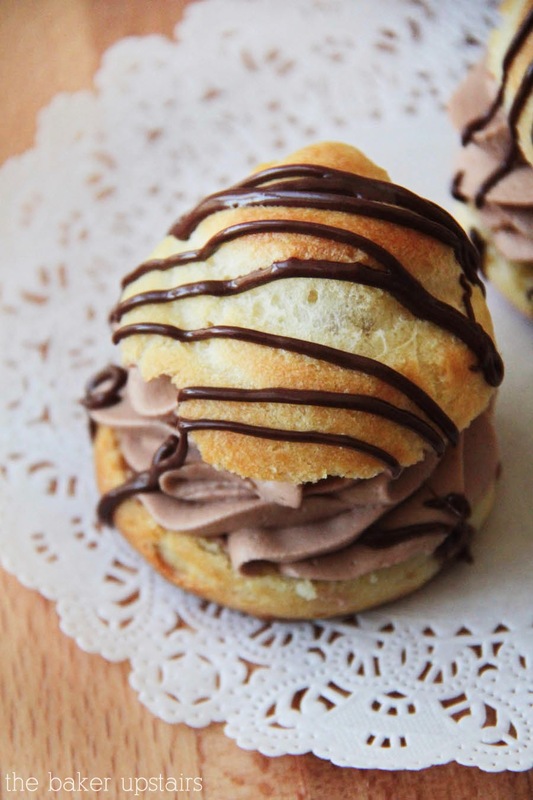 Store cream puffs in the refrigerator. I think I will use your ingredient style to make the chocolate drizzle. I ♥ making cream puffs. I haven't made the chocolate drizzle before so this is a great recipe to follow. Thanks so much for sharing. These look amazing! Can't wait to try them out during the holidays :). I just made it and got 8 the size of my palm. Do you have any tips on getting the nutella cream to thicken like your picture shows? I'm not having any luck. It ends up runny. Hmmm... it may be a temperature thing. It's helpful to keep everything as cold as possible. It could also be that the whip cream wasn't beaten for long enough.